Docker container is a running instance of an image. You can use Command Line Interface (CLI) commands to run, start, stop, move, or delete a container. You can also provide configuration for the network and environment variables. Docker container is an isolated and secure application platform, but it can share and access to resources running in a different host or container. An image is a read-only template with instructions for creating a Docker container. A docker image is described in text file called a Dockerfile, which has a simple, well-defined syntax. An image does not have states and never changes. Docker Engine provides the core Docker technology that enables images and containers. You can understand container and image with the help of the following command. The above command docker run hello-world has three parts. 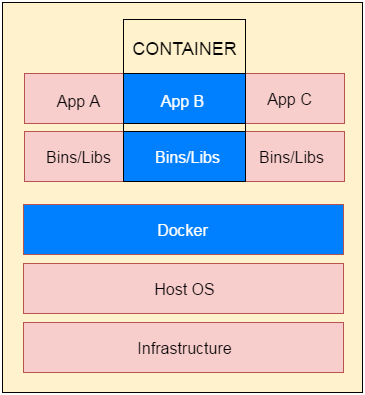 1) docker: It is docker engine and used to run docker program. It tells to the operating system that you are running docker program. 2) run: This subcommand is used to create and run a docker container. 3) hello-world: It is a name of an image. You need to specify the name of an image which is to load into the container.